A stunning hotel known as Chateau De Cassis in Cassis village in France, Europe sits perched atop a rock crag. The Chateau De Cassis along the Blue Coast in the village of Cassis in the Provence, France in Europe was once a medieval castle which was originally built in 1381 and is now an elegant hotel. This magnificent hotel has five luxurious suites each having a view of the Mediterranean Sea and the village of Cassis, France with the rooms only being reachable by staircases or tunnels.The Chateau de Cassis is considered a high priced hotel to stay at but the decor is incredible and the hospitality is priceless. All of the public areas within the Chateau De Cassis in France are made from old castle bricks and the history goes back many centuries.If you are looking for a romantic getaway for you and your loved one be sure to check out the Chateau de Cassis in Cassis, France.Chateau de Cassis, Castle of Cassis in village of Cassis, Bouches du Rhone, Cote Bleue (Blue Coast), Mediterranean, Provence, France, Europe. 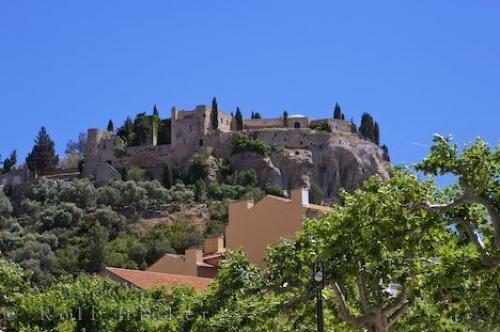 Photo of the Chateau de Cassis situated along the Blue Coast in the Provence, France in Europe.